There have been many books written about bus operators covering the Basildon area of Essex. Here are a selection of those books and publications. Unfortunately, some of these titles listed below are now out of print, but there are 'rare and out-of-print bookshops' and specialist internet websites like AbeBooks.Com AddALL and BookFinder.Com that may be of help in obtaining copies. The internet auction website Ebay is also a useful resource. Some of these titles can also be found at Basildon and other local Libraries. There are in addition a number of Videos/DVDs available, details of which can be found at the bottom of this page. The ISBN (International Standard Book Number), where known, is listed amongst the book details for each entry. 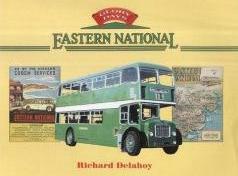 96 page account of the 'glory days' of Eastern National. Fully illustrated with a blend of colour and black and white photographs. Description: 3 page article covering new services introduced by Eastern National in May 1978. 4 black and white photographs of various buses in Basildon locations. Total running time: . Format: VHS (Pal). Text researched and written 2006 with revisions 2010. Copyright © 2006, 2010, Basildon History Online. All rights reserved.